Synopsis: Diagnosed with Stage IV thyroid cancer at 12, Hazel was prepared to die until, at 14, a medical miracle shrunk the tumours in her lungs... for now. Two years post-miracle, sixteen-year-old Hazel is post-everything else, too post-high school, post-friends and post-normalcy. And even though she could live for a long time (whatever that means) Hazel lives tethered to an oxygen tank, the tumours tenuously kept at bay with a constant chemical assault. Enter Augustus Waters. A match made at cancer kid support group, Augustus is gorgeous, in remission, and shockingly, to her interested in Hazel. Being with Augustus is both an unexpected destination and a long-needed journey, pushing Hazel to re-examine how sickness and health, life and death, will define her and the legacy that everyone leaves behind. Reviewer’s note: the following is much less a review than a pondering upon The Fault in Our Stars. It is probably highly garbled, inconsistent and disjointed. Please forgive me; this seems to be a recurring consequence of reading John Green’s novels. “Why love if losing hurts so much? I have no answers any more…. The pain now is part of the happiness then. That’s the deal.” ~ C. S. Lewis in the 1993 film, Shadowlands. That was never said by C. S. Lewis, but it’s the sort of thing I can imagine him saying in lieu of the death of his wife to bone cancer, and it’s so very true to the essence of The Fault in Our Stars. So true, in fact, that it could be a thematic synopsis of John Green’s fourth and most recent work featuring Hazel and Gus, two cancer-ridden teenagers. John Green, of course, needing no introduction here on the internet where his novels are quite Something. 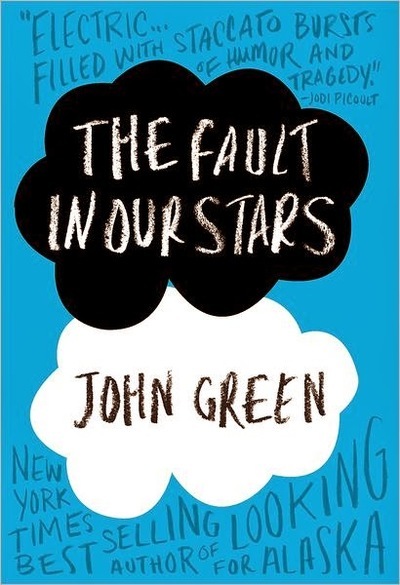 First and foremost it should be said that The Fault in Our Stars is nothing like any Green book, ever. There is less of the angst that so defines Looking For Alaska or Paper Towns– less of the surreality of An Abundance of Katherines, and generally, less Green-overdosing. I would hazard to say that this is because it is John’s (John? Can I call him John? I feel like I know him. I’m calling him John. Sorry, John.) most personal work yet. There are tiny reflections (a better word might be ‘caricatures’) of him within this novel: and though, quite rightly, John says in a disclaimer that “neither novels or their readers benefit from attempts to divine whether any facts hide inside a story”, novels are as much a reflection of the author as anything else. John’s also dealing with a situation with a lot of baggage. Unlike Looking For Alaska, where the tragedy was very much distant, there is no distance in The Fault in Our Stars. My mum wrongly asserted as she rescued me from my weeping stupor some three quarters of the way through, – “we must remember that stories aren’t real”. How wrong that is: particularly about The Fault in Our Stars. It may not be based on real people, but it’s based on real situations- heartbreakingly real situations. What a sobering thought. Or perhaps The Fault in Our Stars feels so much more personal because it is so much more unrestrained than anything he has written before. Is it because of nerdfighteria that John feels he can be ever so much more vulnerable? With such a loving, DFTBAing community, does he feel he can jump higher and step out further and still be caught? I think so. It is always a struggle for me to find words to adequately summarise John’s novels. It is a struggle because his novels don’t deserve to be summarised: he tackles so many things at once, explores so many ideas within a couple of hundred pages that it is nigh on impossible to come to any conclusion without, practically, rewriting the whole book. So I won’t say much more, other than to say that The Fault in Our Stars deserves to be read. It is a heartbreaking read: but as Lewis says, the pain now is part of the happiness then. Just expect to shed a few tears. I did. A whole 40 minutes worth. The Fault in Our Stars is of pain, and love, and loss; it is of tragic and heartbreaking and yet also so very endearing and funny. Funny when it shouldn’t be, when it seems wrong to be funny and yet it just feels so right. The Fault in Our Stars is about death, the dying and the dead, but it’s so full of life that it outshines the liveliest of novels. There’s no denying it; John Green is a genius, and The Fault in Our Stars is his best yet. It is beautiful, poignant, touching and boasts a multitude of sharp and perceptive characters. I can see it becoming a coming-of-age classic. Goodness knows it’s so much better than Catcher in the Rye. What did you think about The Fault in Our Stars? Fantastic review, Rhys. I think you really hit the nail on the head there.